The congregation is both active and passive in worship. In one real sense, they are receiving what has been prepared by the ministers for that particular week. Presentation is, therefore, no trivial matter. Our desire is for believers to hear his word, affirm it as true, and submit to its authority in their lives. In our experience, quality leadership is a vital connecter between the planned elements and people’s response. For each corporate gathering, we designate a service leader. For the Sunday morning gathering, the service leader is usually one of our church’s pastors (a role some churches assign to an elder). Whatever your church’s polity, the service leader should be recognized as a leader in the mold of Hebrews 13. In that passage, Christians are admonished to “remember,” “have confidence in,” and “submit to” their leaders (Hebrews 13:7, 17). If the service leader is recognized in this way, he has the credibility to instruct the church toward meaningful worship activities, like confession of sin. In our worship gatherings, the service leader reads the call to worship, gives an opening prayer, reads a mid-service Scripture reading, leads the mid-service prayer, and concludes the service with prayer and the final benediction. The qualities necessary for leading Scripture readings are primarily intuitive. At a minimum, the service leader must read Scripture passages loudly, clearly, and slowly. Be especially mindful of the need to project one’s voice in a congregation with elderly members. Failing to project may stoke their feelings of frustration and embarrassment, which prevents the emotional response intended in the planning process. In order to achieve clarity in reading, the service leader needs to review all selected passages beforehand. He should make sure he has a sense of the flow of the sentences and that can pronounce all of the words in the passage. For those difficult Hebrew words, a good principle is that no syllable has more than one vowel (e.g., Zeruiah, 1 Kings 2:5, consists of four syllables, Ze-ru-i-ah), though anglicizing common Hebrew terms is appropriate (e.g., “Dan-yil” for Daniel, instead of Da-ni-el). The service leader must also give due regard to the pace of his reading. A few pacing techniques — such as maintaining a deliberate speed and pausing before or after key lines of text — appeal to the ear of the congregation and encourage engaged listening. Scripture reading introductions are useful in preparing God’s people for specific actions. Before a prayer of confession, a service leader might introduce a Scripture reading by saying, “Our Scripture reading this morning is 1 John 2:1-6. In a few moments, we will confess our sins together. Let us do so remembering, as the apostle John writes, that when we sin, we have an advocate in Jesus Christ, God’s Son.” A Scripture reading needs to be chosen in such a way that enables it to be heard and understood in plain reading. Trust in the power and effectiveness of God’s word simply being read and heard. Introduce the reading as such, knowing that explanation and exposition are soon to come. The conclusion of a Scripture reading provides another opportunity for worship leadership. The service leader can conclude the Scripture reading in a way that conveys the significance of the word read aloud. Even a simple “Amen” confidently punctuates a Scripture reading. Some service leaders end their readings with the reminder that “this is the word of the Lord.” Others use a statement like “blessed be the word of the Lord” to encourage the congregation in believing what it has heard. A brief conclusion that communicates convictions about Scripture and is consistent with the leader’s personality supports the reading of God’s word. — Brian Croft and Jason Adkins, Gather God’s People. Find more practical guidance in leading prayer, Scripture reading, and singing in Gather God’s People. 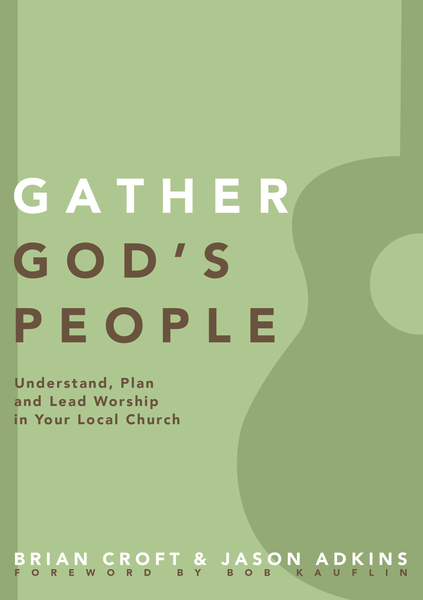 Gather God’s People will equip you to plan and lead worship services with deeply biblical rooting – worship services that bless your church and honor the Lord.